Why Can't Calzaghe Understand Froch's Bitterness About Him? Why Can’t Calzaghe Understand Froch’s Bitterness About Him? By Michael Lieberman: It seems as if former World Boxing Organization super middleweight champion Joe Calzaghe (46-0, 32 KOs) is a bit out of touch as to why World Boxing Council super middleweight champion Carl Froch (24-0, 19 KOs) has some lingering bad feelings towards him. Why wouldn’t Froch? After all, Calzaghe chose to bypass him for the past three years of his career even though it was clear that Froch was one of the best fighters in all of boxing. There was no doubt whatsoever that Froch was the 2nd best fighter in the UK, in terms of super middleweights. So why wouldn’t Calzaghe fight him? Calzaghe says he has nothing to prove, but it seems to me that Calzaghe had a lot to prove and he did a poor job of proving anything other than he can beat an old Roy Jones Jr. and get a questionable decision victory over Bernard Hopkins. Calzaghe could have fought Froch at some point in the past three to four years of his career, there’s no doubt about that. Instead, Calzaghe chose to fight opponents like Peter Manfredo Jr., Mario Veit, Evans Ashira and Sakio Bika. I don’t about you, but I think Froch is a lot better than any of them, and would likely knock them all out except for Bika. Calzaghe should have done the right thing and fought Froch. The UK is an incredibly small dot of an island, and it’s frankly astonishing that Calzaghe could have chose to avoid fighting Froch and chose fighters like Manfredo Jr., Veit, Ashira and Bika instead of facing Froch. To me, it seems as if Calzaghe took the easy way out by fighting weaker punchers and ones that he knew he could get by with a minimum of problems. I can certainly see why Froch would be mad and would continue to be angry about even now. Calzaghe screwed Froch out of out a good payday and a chance to build his own legacy by destroying Calzaghe. With a place as small as the UK, I don’t understand how Calzaghe could have gotten away with not fighting Froch. If this was in the U.S, Calzaghe would have been shamed into fighting him, and if he didn’t, the boxing fans would turn their backs on him and disown on him. It’s strange that the same thing didn’t occur in the UK. What is up with that place? It seems like some kind upside down World to me. Calzaghe should have been dragged into the ring for a fight with Froch, and stripped of his WBO title if he chose to run away. 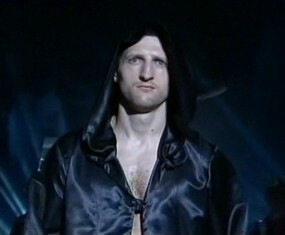 Boxing » Carl Froch » Why Can’t Calzaghe Understand Froch’s Bitterness About Him?